The French GP was back at Rouen in 1964 and the battle between Jim Clark's Lotus and Dan Gurney's Brabham for dominance continued with Clark taking pole position and Gurney second. 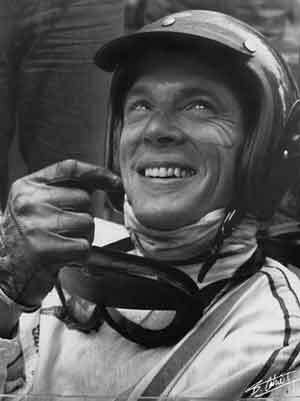 John Surtees was on the outside of the front row in his Ferrari while the second row featured Clark's team mate Peter Arundell and Jack Brabham in the second Brabham. The BRMs were not very competitive on this occasion with Graham Hill sharing the third row of the grid with Bruce McLaren's Cooper and Lorenzo Bandini in the second Ferrari. There was no practice on the Saturday and so Mike Hailwood flew off to race in the Dutch TT at Assen (which he won). Unfortunately there was an airline strike that night and Hailwood had to drive through the night to be back at Rouen on race day at the wheel of his Reg Parnell Racing Lotus. At the start of the race Clark went into the lead with Gurney and Surtees chasing him. During the first lap McLaren spun to the back of the field. On the third lap Surtees dropped back with a split oil pipe and Graham Hill had a spin and so Clark and Gurney were left alone at the front with Brabham moving up into third. G Hill recovered from his spin and worked his way back up to fourth place by lap 24. Seven laps later Clark's engine failed him and so Gurney was left in the lead with Brabham a long way behind and G Hill closing fast on the Australian. On lap 37 Hill overtook Brabham but Jack stayed with him and the two were separated by less than a second at the finish. Brabham might have been frustrated but as Gurney had just won the team its first World Championship victory it was a good day for the team.